Indoor volleyball is played on a wooden or plastic (nylon type material) floor. Shoes are worn (as a pose to beach volleyball where they are not) along with knee pads, ankle braces, shorts, shirts and socks. This type of volleyball tends to have set roles for each player, whereas beach volleyball every player is basically a rover (and they all have to be good at every aspect of the sport). 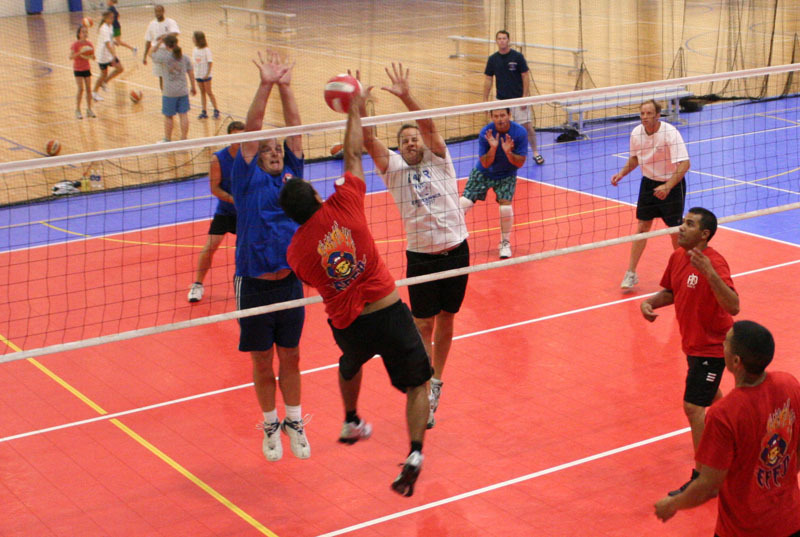 Indoor volleyball has a number of different skills that are unique. Learning to set and pass is the first step that needs to be overcome, but learning to serve, spike and block properly can also take quite a bit of time. As there are more players on an indoor volleyball court, teamwork is even more essential. You are still only allowed 3 touches per side, which means that players will touch the ball less. However, volleyball indoors tends to be a bit more spontaneous in the fact that the ball can go to one of 5 hitters, and you never know which one. At the end of the day, whatever volleyball you play you will have a lot of fun.